Product #25945 | SKU SDMX26-008G-G46B | 5.0 (based on 1 rating) Thanks for your rating! 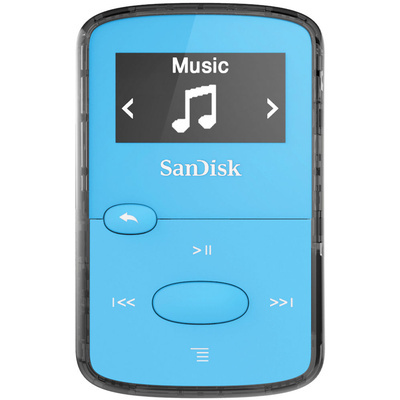 Clip and listen to your music on the go with the blue SanDisk 8GB Clip Jam MP3 Player. This lightweight MP3 player features 8GB of flash memory and a microSDHC card slot that supports memory expansion. The player has a convenient clip that's designed to keep the device secure - even if you're working out. Just clip it to your clothing or wristband, and hit the gym or head out for a jog. The Clip Jam is also equipped with a 1" bright monochrome screen that makes it easy to navigate the intuitive user interface. You can quickly choose songs sorted by title, artist, or album. The Clip Jam can play back MP3, AAC, WAV, FLAC, Ogg Vorbis, DRM-free WMA, and AA. Plus, there's an integrated FM tuner for listening to your favourite radio stations. The device's built-in rechargeable battery provides up to 18 hours of continuous audio playback as well. No matter what your mood or musical preference, the Clip Jam is equipped with the tools to keep you entertained for hours. Just use the included USB 2.0 cable to transfer your favourite songs, audiobooks, and podcasts, and you're ready to go. The Clip Jam supports both Mac and Windows operating systems, including Windows 10.